Jonas Bekaert won the first prize for best speaker at the 2018 Young Speaker Contest of the Belgian Physical Society for his seminar on "Monolayer materials as an ideal platform for enhanced superconductivity". Victor Fernandez Becerra was awarded in the best poster contest of the International Conference on Multi-Condensate Superconductivity and Superfluidity in Solids and Ultra-Cold Gases in May 2018 in Trieste. Dr. Ben Van Duppen was the winner of the Flemish PhD Cup competition. Sara Conti was awarded the Best Poster Award in the poster competition of the "Strongly Coupled Coulomb Systems" conference. Sara Conti was awarded the first prize in the poster competition of the Belgium Physical Society Meeeting (Mons, May 17 2017) for her poster on "Multiband effects in the BEC BCS crossover in double bilayer graphene". Ben Van Duppen was awarded the First Prize in the Young Speakers Contest at the Annual meeting of the Belgian Physical Society in Ghent. Lingfeng Zhang received the "Chinese government award for outstanding self-financed students abroad". Jonas Bekaert won the first poster prize in the Ninth International Conference on "Vortex Matter in nanostructured Superconductors" (VORTEX IX, 12-17 September 2015, Rhodes, Greece) for his presentation entitled "Type-I behavior in the multigap superconductor OsB2". Prof. Milorad Milosevic has been awarded Elsevier's "Outstanding Reviewer Status" for being in the top 10th percentile in terms of the number of reviews completed for Physics Letters A in the past two years. Jonas Bekaert won the "Umicore Materials Technology MSc Awards 2015", awarded by the FWO, for his master's thesis "First-Principles Electronic Structure Calculations of Cu(In,Ga)Se2 photovoltaic absorber materials"
Zeljko Jelić won 3rd place in the best poster award at the International Workshop Shyned 2014 - Physics and application of superconducting hybrid nano-engineered devices. 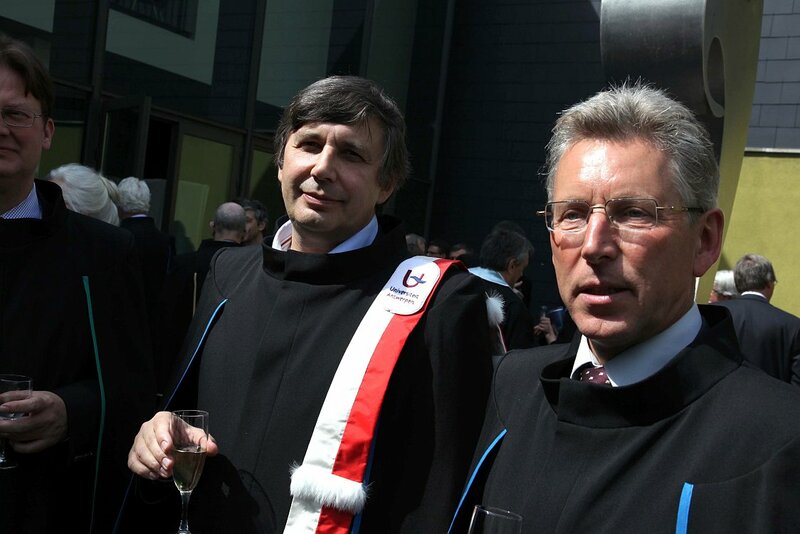 Prof. Francois Peeters was awarded the Francqui chair (2013-2014). Ben Van Duppen won the "Gobelijntje", the prize for the best teaching assistant within the Faculty of Sciences of University of Antwerp. The prize is awarded each year to the best professor and best teaching assistent of each Faculty by the student organization Prisma based on the votes of students. Nansheng Lin received the "Chinese government award for outstanding self-financed students abroad". Ben Van Duppen won the prize for the Best Master thesis 2012 awarded by the Belgian Physical Society (BPS) on the 22nd of May 2013 at the annual general meeting of the Belgian Physical Society in Louvain-la-neuve (UCL). Dr. Mehdi Neek-Amal received a Marie Curie international postdoctoral fellowship of 24 months to do research at UAntwerpen. Haijun Zhao received the "Chinese government award for outstanding self-financed students abroad". Prof. F. Peeters was elected member of the Royal Flemish Academy of Belgium (KVAB: Koninklijke Vlaamse Academie van Belgie). The IAP/P42 network awarded Dr. O. Leenaerts the annual PhD prize for the best PhD thesis. Dr. Golibjon Berdiyorov received the prize of the UA Research Council 2011: "Prijs van de Onderzoeksraad Frans Verbeure"
Dr. Golibjon Berdiyorov was awarded the best Poster Prize at the 13th Int. Workshop on Vortex Matter in Superconductors (31 July - 5 August 2011, Chicago). The IAP/P42 network awarded Dr. H. Peelaers the annual PhD prize for the best PhD thesis. 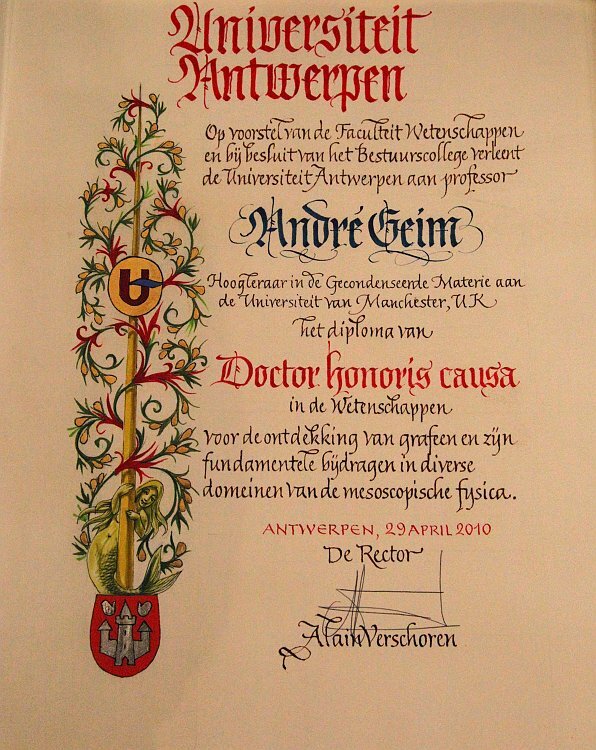 Prof. Francois Peeters was elected to become member of "Academia Europaea"
Xu Ben received the "Chinese government award for outstanding self-financed students abroad"
On April 29, 2010 the Universiteit Antwerpen honoured Prof. Andre Geim with the title of Doctor Honoris Causa. 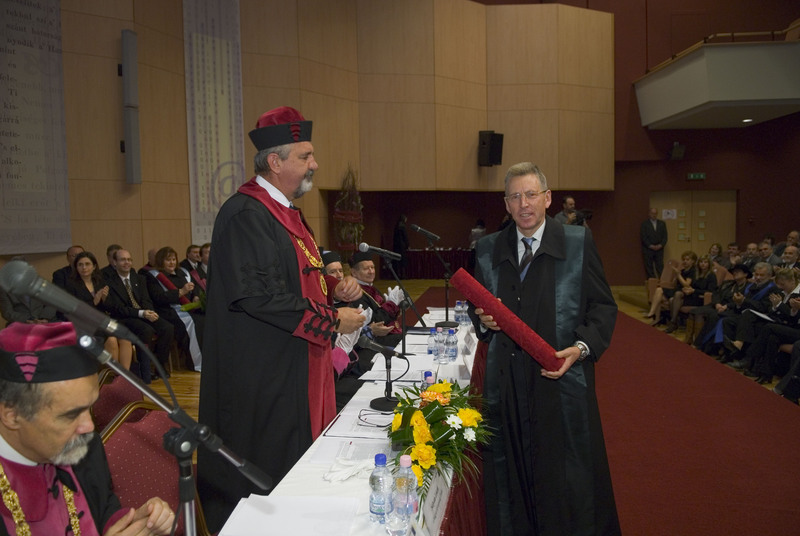 He subsequently received the Nobel prize on October 5, 2010. View diploma, photo or read article (in Dutch). The Academia Europaea awarded Prof. Milorad Milosevic the ‘2010 Burgen scholarship’. These awards are given to early stage scholars (Leuven, September 9). Hartwin Peelaers received a BAEF (Belgian-American Education Foundation) fellowship to perform research at the University of California, Santa Barbara. Prize of the UA Research Council 2007: "Prijs van de Onderzoeksraad Frans VERBEURE"
Best poster in the Joint International Workshop on Nanosensors and Arrays of Quantum Dots and Josephson Junctions for space applications. 1-8 April 2006, Bjorkliden, Kiruna, Sweden. Poster - Novel commensurability effects in superconducting films with antidot arrays. G. R. Berdiyorov, M. V. Milosevic, and F. M. Peeters. Marie Curie individual fellowship, 24 months - Bath, UK. mesoscopic superconductivity and nanostructured semiconductors." Best poster of the Summer School Arrays of Quantum Dots and Josephson Junction (AQDJJ) (European Science Foundation (ESF) Programme), June 9-25, 2005, Kiten, Bulgaria. Poster - The superconducting state in a mesoscopic wire with constriction. A. K. Elmurodov, D. Y. Vodolazov, and F. M. Peeters. Second prize of the contest for the best oral presentation on Congrès Général de la Société Française de Physique et de la Belgian Physical Society, 31 August 2005, Lille, France. Talk - The crystal field of C60 molecules in carbon nanotube. B. Verberck, K. H. Michel and A.V. Nikolaev. University Antwerp: Innovation prize 2004. Second prize in the Contest of the Belgian Physical Society for the best Poster Presentation, 2004. Poster - Vortex-antivortex ionic crystals in superconducting films with magnetic pinning arrays. M. V. Milosevic and F. M. Peeters. Prize of the UA Research Council 2003: "Prijs van de Onderzoeksraad Frans VERBEURE"
Third prize in the Contest of the Belgian Physical Society for the best Oral Presentation, 2003. Talk - Superconducting Wigner vortex molecule near a magnetic disk. International Workshop, Fullerenes and Atomic Clusters, 30 June 2003, Saint-Petersburg, Russia. Paper - Theoretical model for the structural phase transition and the metal-insulator transition in polymerized KC60. B. Verberck, A. V. Nikolaev and K. H. Michel. Superconductors (VDHTS 2002), 17-22 May 2002, Tashkent, Uzbekistan. Talk - Vortex matter in the presence of magnetic pinning centra. First prize in the Contest of the Belgian Physical Society for the best Poster Presentation, 2002. Poster - Influence of strain on the magneto-exciton in single and vertically coupled type-II quantum dots. K. L. Janssens, B. Partoens, F. M. Peeters.